Local talent Ryan Ferrier has once again pumped out a unique and raw book (see D4VE). 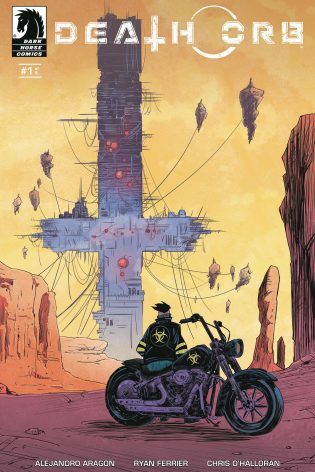 The book looks like most post-apocalyptic books do: brooding colors, rough art, and motorcycles. But this ain’t your momma’s comic book. In the first few pages, the protagonist is immediately thrown in the deep end with a group trying to kill him. Once he clears up that… disagreement… he continues his search for his family. As with most bleak futures, everything is run by a powerful group that controls all aspects of life, including information. It’s gonna be a rough one for this guy! Local Calgary Talent Strikes Again! Once again, Ferrier grabs you by the jewels and doesn’t let go. And with only five books to get the story done, it pretty much has to be a thrill ride to get the entire story done. The great part is the dialog is terse without losing the plot. It’s easy to sympathize with the main character that, while not all that likable, is really just trying to find his wife. In addition, the art by O’Halloran fits the story without being too rough. There’s plenty of books out there that believe that these bleak future books require art that looks almost incomplete. This art is utilitarian to be sure, but it fits the story perfectly. Don’t get me wrong, it looks good. You don’t need glitz in order to tell a story well. As I say with most mini-series, this isn’t a huge investment to enjoy a complete story. If you are in Ferrier’s previous work, its really a no-brainer. However, if you like books like Walking Dead and the like – you’ll enjoy the heck out of this.